Can You Spot the Monarch in the Crowd? News Flash! Monarch butterflies have started their amazing migration south and they should be coming through Georgia about now. Monarchs have gotten lot of press recently and people everywhere are pitching in to help them out. Every time we see an orange butterfly, we think (hope actually) that it’s a Monarch. But we’re often fooled by at least three other orange butterflies that resemble the Monarch: the Viceroy, Gulf Fritillary and Queen. As you can see, the Viceroy looks the most like a Monarch. 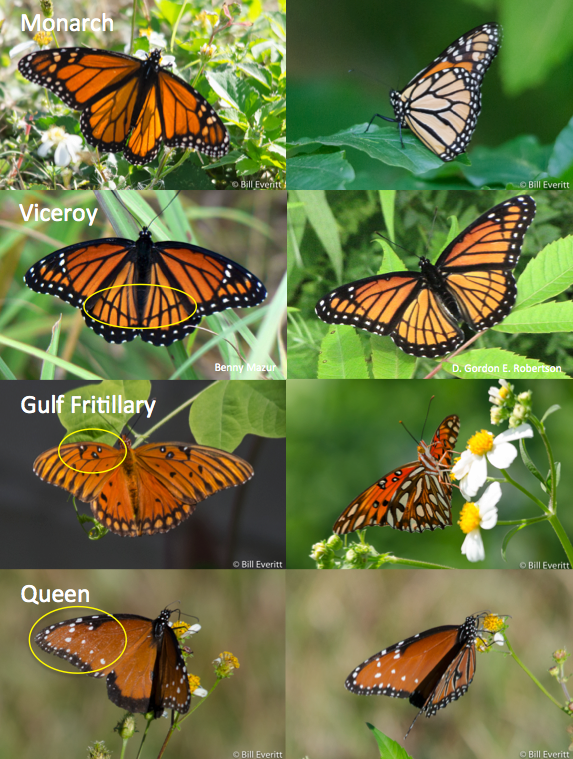 The horizontal black stripe near the bottom of the wing (circled in yellow) is the biggest clue that you are looking at a Viceroy, not a Monarch. This mimicry is by design to enable the Viceroy to fool predators into thinking it is a Monarch which is toxic. This graphic also appears on our page Orange Butterflies so you can bookmark it for future reference. Keep your eyes peeled for all of these beautiful butterflies. This entry was posted in Butterflies, Monarch Migration and tagged Gulf Fritillary, Monarchs, Queen Butterfly, Viceroy Butterfly on September 15, 2016 by beveritt.